Spitfire is the story about a particularly famous aircraft and about how a mythology grew around it. In exploring this it also captures how as time moves on, the past can grow in stature. The Supermarine Spitfire was a feat of engineering, a design that accommodated several advances in technology allowing it to remain a viable front line fighter throughout World War II. Beautiful and elegant in the air, loved by pilots, it proved an inspiring sight to a public facing invasion. Other planes from that era that played their part in history, yet the Spitfire is fixed in the public’s mind as the winner of the Battle of Britain which establishes the myth. 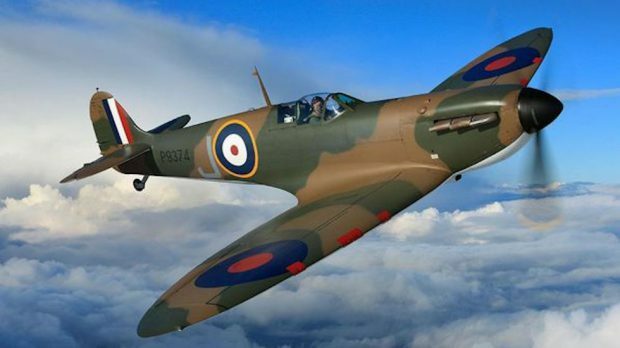 The story goes if the Spitfire won the Battle of Britain then it preserved Western democracy for the 20th century and therefore it could be argued it is the most important aeroplane in history. It has come to represent at the very least British supremacy, ingenuity and fortitude in the face of impossible odds. Never mind that the Hawker Hurricane, more readily available, shot down more enemy during the battle. With the full cooperation of the Royal Air Force, the documentary lovingly frames the famed interceptor against English fields, cinematic sunsets and the iconic white cliffs of Dover. While it does have its cake and eat it too, there are some surprising reflections about that battle, that war and this aircraft. Shown parked in the same airfield with consortium manufactured Eurofighters, we are taken back to a time when Britain produced its own fighters alone and made world-beaters. Modern audiences may not be aware of Leslie Howard’s 1942 film The First of the Few but it is referenced here in the telling of Supermarine designer R.J. Mitchell and how the Spitfire came about. Then to the war and to the young men who flew in combat. Now all much older but still handsome and well measured in their thoughts and reflections. Through them we get the sense of how the Spitfire was designed to kill …and kill it did. There is no glory in that and yet these men were fighting for survival. As their numbers dwindle their reflections are sought more, the fading of one age almost complete. A marked contrast to the well maintained and newly polished flying examples of the plane they once piloted, and yet in so few remaining numbers like themselves. Other stories are glossed over, with a fleeting reference to the fact that other nationalities piloted the Spitfire in the Battle of Britain. More time is given to the female Air Transport Auxiliary pilots who ferried the planes through hostile airspace from the factories to the airfields. Their contribution having only in recent years been celebrated, includes recently passed away ATA veteran Mary Ellis delighting with her spirit and fond memories at 100 years of age. The defence of the Mediterranean island of Malta is also mentioned, D-Day and the taking down of V1 rockets. No footage is used from films like The Battle of Britain (1969), The Malta Story (1953), Dark Blue World (2001) or even Dunkirk (2017). After honouring the memory of Mitchell and the wartime film that helped create the public’s adoration for the aircraft, the focus remains on black and white war footage cut together with filming of the interceptor today. It is a solid production, thoughtful in its deliberations on the excitement and toll of war, indulging in the legend of the Spitfire while also explaining how it was constructed – both plane and myth. No one film could really give justice to all the stories that can be told about this indelible fighter plane. Yet we have a tightly constructed 90 minute documentary that proves interesting in some moments more than others, but is always considered and respectful to an aircraft and a few from which we owe so much.